In 2014, more than 36,000 postal workers were injured or sickened at work. At least 10 suffered fatalities. Here’s the simple truth: If we want a safe workplace, we have to work together to make it happen. Please join this important effort. A safe workplace must be the right of every worker! Check out the fact sheets and the other material linked here to learn more. Recently our sisters and brothers who work for other federal agencies had their collective bargaining rights attacked. In a series of Executive Orders, President Trump forced agencies to re-write collective bargaining agreements under new guidelines. This is how Article 14 of our Collective Bargaining agreement with the Postal Service begins. That one sentence is very powerful and tells all of us that the highest-ranking postal manager – the Postmaster General – recognizes that ultimately it is their responsibility to provide a safe and healthy work environment. You may hear supervisors and managers say that safety is “everyone’s responsibility” or that every accident is “preventable.” But how often do you hear that safety is every worker’s right? 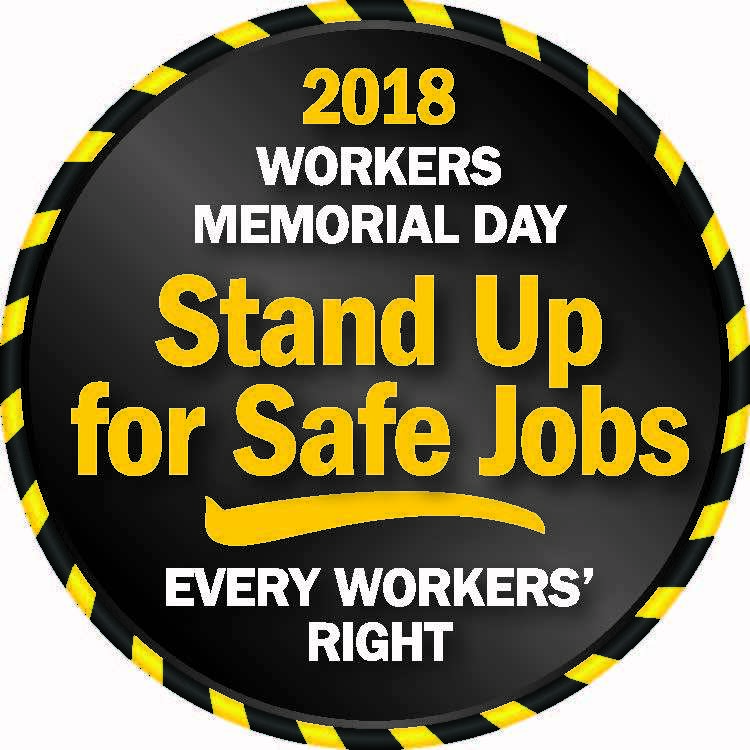 Each year on Workers Memorial Day (April 28), working people throughout the world remember those who were hurt or killed on the job and recommit to the struggle for a safe workplace. The Post Office is a dangerous place to work. In Fiscal Year 2017 alone, 12 postal employees died on the job and 42,594 injury claims were approved. This Workers Memorial Day, we call for an end to the unnecessary injuries and deaths of our brothers and sisters. We push for action by – and increased protections for – all workers. Report safety hazards in the workplace and let’s hold management accountable to fix them. 04/10/2018 - Each year on Workers Memorial Day (April 28), working people throughout the world remember those who were hurt or killed on the job and recommit to the struggle for a safe workplace. 03/16/2018 - The APWU was informed on October 26, 2017 of the Postal Service’s intent to roll out a new program called the Safety Ambassador Program. The Postal Service intends to replace the safety captain program, and any other local safety programs, with this “standardized” and nationally controlled program. The American Postal Workers Union does not support, agree with, or endorse this program. We all know and enjoy our holiday – Labor Day. But did you know that there is another day that honors the workers of the world? It is celebrated on April 28 of each year, and it is Workers Memorial Day. This day honors and remembers those who have suffered from injuries, occupational illnesses and died while on the job. This day is also the day we renew the ﬁght for safe jobs. Every worker has the right to a safe workplace. Most APWU members know first-hand what can happen if proper safety procedures are not followed by management. The simple truth is: If postal workers want a safe workplace, APWU members have to work together to force management to make changes when necessary. Stand Up for Safe Jobs! Can it Hurt Me? Can it Make me Sick?